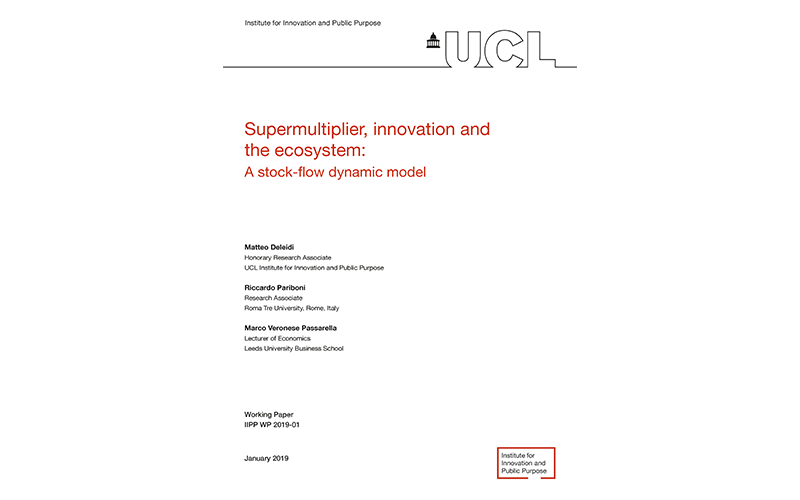 This work builds upon four different theoretical approaches: i. the Sraffian supermultiplier model; ii. the Schumpeterian framework of evolutionary economics that emphasises the entrepreneurial role of the state; iii. the ‘stock-flow consistent’ approach to macroeconomic modelling; and iv. recent developments in ecological economics literature aiming at cross-breeding post-Keynesian theories and models with more traditional ‘green’ topics. Our main purpose is to develop a simple analytical tool that can help examine: a) the impact of government spending on private innovation; b) the impact of innovation on economic growth and the ecosystem; and c) the impact of ecological feedbacks on economic growth and government spending effectiveness. We find that, in principle, government can be successful in supporting innovation and growth while slowing down matter and energy reserves’ depletion rates, and tackling climate change. However, the latter may well affect government policy effectiveness.